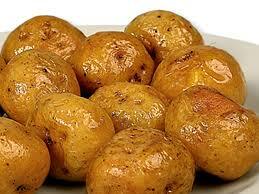 Papas Criollas (Creole Style Potatoes) - Tienditadepuertorico.com - Buy Puertorican Food Here!! Put potatoes in medium saucepan and pour in enough cold water to cover completely. Turn off heat and scoop out potatoes with slotted spoon . Place potatoes on a paper towel-lined baking sheet. Roll them around to dry skins. Pour olive oil 1/4 inch up a skillet large enough to hold potatoes in a single layer. Heat oil over medium heat until rippling. about getting the potatoes crispy, because they are going to simmer in sauce. Add sofrito, oregano, paprika, red pepper flakes, and pique. Bring to boil and cook for a minute or two. Stir in tomato sauce and bring to boil. Season lightly to taste with salt. Lower heat to simmer gently. Cover pan and cook until potatoes are tender but not mushy, about 15 minutes. Taste sauce and reseason if necessary. Garnish with minced cilantro to serve.